We have some sugar maples on our land. The process of getting syrup from them is intimidating, because it sounds like it is a very lengthy and tedious event. Just in case, though, the boys and I hiked around the land marking sugar maples. They are easier to find when the leaves are still on, so you need to mark them in the fall. Tapping for syrup happens in the winter. I won a pair of Oboz boots at GoFest this year, from a drawing that Walkabout Outfitters did, which I love. 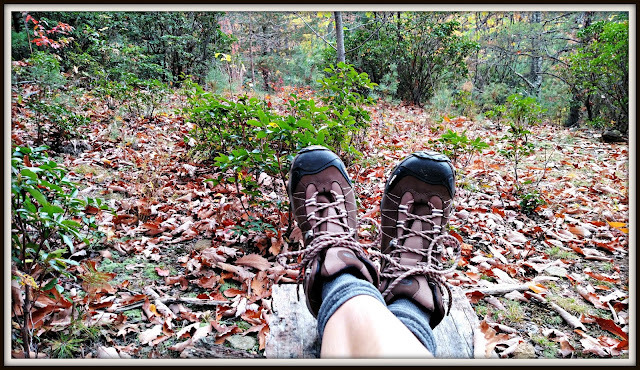 My old hiking boots were too small, because my feet grew a half size with each pregnancy. When we finally take our backpacking trip, hopefully I'll have these well broken in. Readers, do you know what a sugar maple tree looks like? I saw maples tapped over in the valley years ago but the guy wasn't getting the volume he needed from what I remember. I think he said something about needing colder weather like up north or at a higher altitude like in Highland county. But I suspect that you could get enough to have fun with the boys. Any maple will work but the sugar variety has a higher percent of sugar. Over there it would drip down the trees and evaporate and I would lick the sugar off of the bark, I had to reach higher than the cows though. I think it takes a mature tree with enough bark built up as I never saw a small tree tapped. I saw taps made out of a piece of half inch pipe with a slot cut in the top to hold a gallon milk jug. Good boots I would be happy with some like that for sure! congrats on the win and good luck with the tapping! A number of people tap Maples here in Mid Missouri. They also will tap Boxelder trees which are also excellent sap producers and in the Maple family. I have never done it myself but I know from trimming the several Maples and Boxelders I have growing around the place that the sap does flow pretty good in February and March. I have thought about doing it a time or two but I would need more trees than I have access to on the Small-Hold. My neighbor ends up boiling down about 20 gallons worth every Spring though and gives us some. Those are great boots. What a cool prize! our next door neighbors had a gorgeous sugar maple in the front yard . . . too bad for me they had it taken out . . . (yep, they sold it . . wow.) It was so lovely, i miss it a lot. Really? Your feet grew? Thanks for sharing, i didn't realize . . .
Congrats on your win - the boots look really comfy!! That is so cool you have maples and can tap them. Not happening here LOL. WTG on the boots! Nice win. I have a pair of Merrell hiking boots I have had over 20 yrs and they are still good! They are indestructible I am starting to think. Oh they look a bit worse for the wear but they are still dry and good soles etc. I have heard other women say their feet grew when they were pregnant, not having ever had kids I haven't experienced that but it seems to be fairly common. You have to wonder why your feet would grow LOL because of pregnancy. Nice boots! Can't say I could identify a Sugar Maple. I am sure my husband could, though. We have maple trees.. but we do not think they have syrup in them! Very nice boots!! love them! Don't even tell me you make your own syrup too!! It'll be nice if you post a picture of them. Your new hiking boots look so comfortable and lovely. My feet also grew a lot bigger lately, but not after my pregnancy. your heartfelt comments!! I highly appreciate true friendship. congrats on the win, how fun! my feet did the same with my pg's too! I have no experience with sugar maples or tapping, but sounds like great fun. Love the boots, and congrats on winning the drawing for them! Good luck I know someone who has done it - it is a big project - but if anyone can do it - it's you! My neighbor has lots of Maple trees. I don't know the difference in my Maple trees though. I love your boots! I wouldn't know a sugar maple tree if it hit me in the head LOL I was hoping you'd show one in your post! I know maples in general but not by their first names. My feet flattened out (grew) during my 3 pregnancies. Never tightened back up, so I had to get new boots too. I know hard maples on sight, but am not sure on sugar maples. Love the boots. Sounds like a fun adventure! Good luck with the tapping. Apparently my son learned how to find sugar maples in his kindergarten class last year. I didn't have the pleasure of going on the expeditions with him.